Allegations have been raised against a post was published on 12th May 2017 in the Ahmedabad Mirror claiming that the University had misrepresented placement data. Allegation 1: The student of ILNU who had received the 16L offer, had not done so through the College Placement Cell but had received a PPO through their own efforts. Institute had shared the interim report of graduating students and their placement wherein it was mentioned that one of our students got an offer through PPO of approximately around 16 lakh. which was shared by the student himself to the institute. This PPO he has earned through the rigorous internship at the firm that we all know. the report of the institute had nowhere mentioned that he has got this offer through CRC (Campus Recruitment Committee consists of students and faculty incharge) by bringing the law firm at the campus. it was never intended to misguide or misrepresent the fact the only intention was to feel proud of our student and share that pride. Picture 1 is the actual Press Note supplied by the University to Ahmedabad Mirror, which has been provided to us by the University. "The highest package offered was around Rs 16 lakh per annum and the average package comes to around Rs5.25 lakh, offered by top domestic law firms and corporates among others. Overall, the feeling is that all the recruiters who have visited the campus or who have opted off campus placement drives, were extremely happy with the quality and skills of the students of ILNU...."
What is even more blatantly obvious is that Ahmedabad Mirror choose to edit and change the verbatim of the Press Note and published something which was not only ambiguous but also started this entire fiasco in the first place. Essentially every single accusation being leveled towards NIRMA University in this instance stems from the fact that the Editor of Ahamabad Mirror apprently left out some words in the middle of the sentence. Allegation 2: That the student in question himself was unaware of his package and hence Nirma University announcing that the student had received a package of 16L was misleading. 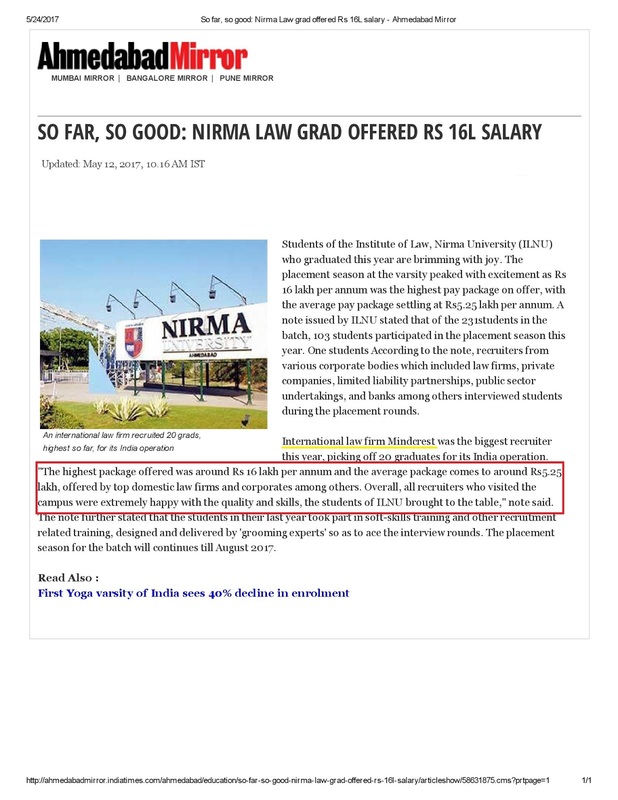 According to the Ahmedabad Mirror itself, the placement coordinator for Nirma has already clarified this stating, "No law firm provides written details about pay package. Students are informed verbally about it at a later stage. We calculate the average package based on information provided to students and through figures available about the pay packages from the market." Arguendo's Analysis: The author of the articles in both Ahmedabad Mirror and Libertatem Magazine fail to take into account that Law firms have standard fixed packages in general. As per available data published in Legally India, the last mass hike in salaries across top law firms was in the year 2015 and from 2016 salaries ranged in tightly fixed stable brackets. Essentially if you make it into a top law firm, it can reasonably be guessed as to what will be the pay package offered to you. 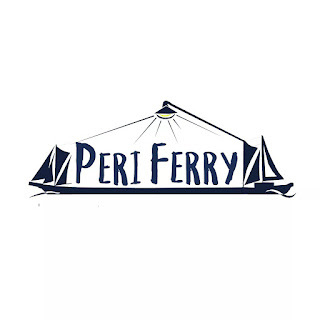 Other places which give an overview of previous years salaries offers are here, here, here and here. 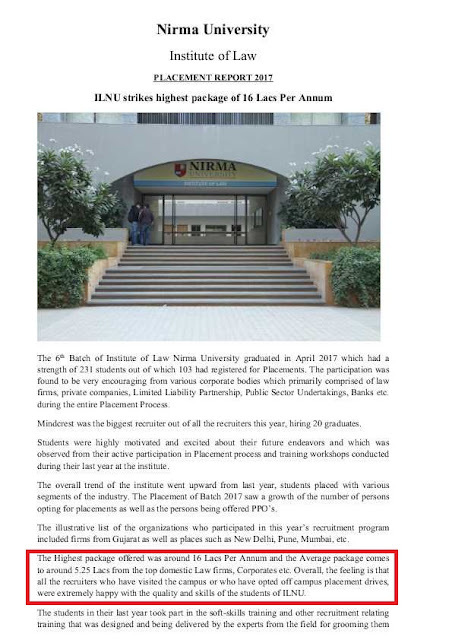 Again, at no place has the management of NIRMA University even remotely misrepresented on any aspect but merely drawn an inference from available data. Subsequently, on the 18th of May 2017, Ahmedabad Mirror went ahead and covered a story stating that Nima was apparently threatening its students with defamation and restricting them from speaking against the college. 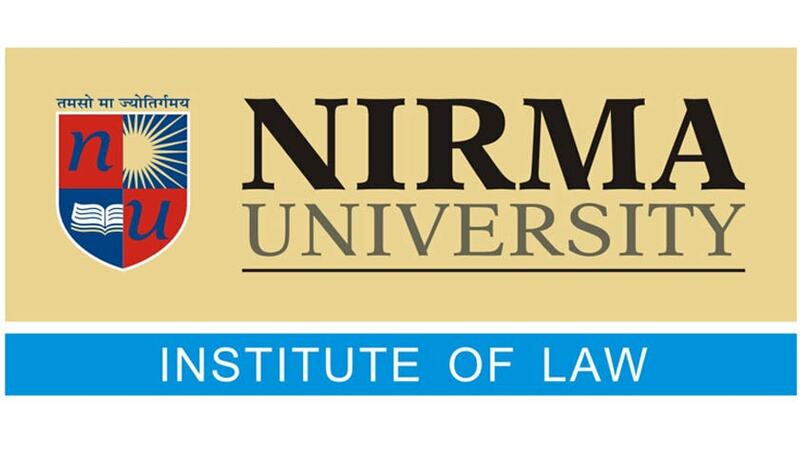 Arguendo got in touch with the Director of Institute of Law, Nirma University, who was kind enough to forward to us the email in question, which was sent to students after the first articles were published. I came to know recently about some very shocking state of affairs. Some of our students indulging and trying to defame the institute where they studying. If any students has got any issue any query can directly write to administration but engaging yourself in an activity which belittle the institute is not tolerated. It's ultimately damaging the future prospects of you all existing students. The first and fundamental lesson of law education is not to be judgmental if you do not have facts in your hand. Get your facts corrected before you opine and defame your institute on social media. Approach an appropriate authority to present your grievances/issues/comment if any. The difference between law man and layman lies here. It's very easy to belittle an image of an individual or an institute making of which might have taken huge sacrifices and sheer hardwork of many people. I make a sincere appeal to all of you to take care of this and refrain from any activity which ultimately harms the students' future prospects." Arguendo's Analysis: We leave the readers to judge this for themselves. But we clearly fail to see how websites like Lawctopus, Legally India and any other websites which may have alleged the same, reach the conclusion that the students of the University were "threatened with defamation" or their "freedom of speech were curtailed". It seems evident that the Management, in the email shared above, only pointed out that if there were any grievances, there were proper channels of redressal for the same. Spoiling the name of the institution would only damage current students. The established process of grievance redressal is in all Universities and it would be quite a stretch to think that requesting that students respect the process cannot be a threat as such. It is also interesting to note that Lawctopus, Legally India, and Ahmedabad Mirror cited and shared an email sent by an ex-student, who had raised multiple allegations against the University. However surprising all the three previously mentioned websites fail to do however is share the reply by the University which clarified and rebutted all the allegations of the ex-student. Note From Our Editor: No University is perfect. There were allegations of nepotism, corruption, and mismanagement even in Universities such as NUJS, NUSRL, and NLSIU among some. As Law students and future lawyers of this Country, it is the duty of ever student to raise a voice whenever they see something wrong happen. But such voice should not be raised merely for the sake of hearing loud voices. As Law students, we have the greater responsibility to verify everything we say or post. Unverified allegations without proof are not something we as Law students should be buying into. No University is perfect. But something close to perfection can be achieved once students and management work together in tandem. I am a faculty there. We cannot reach the director how did you reach? If she chooses to talk to you only please give her a message that some of the faculties have emailed her for some work, please respond. When one of the student of 2017 mail you regarding ILNU placement. You did not respond because he tag Director General. Mam please dont make such egositic statement. Many faculties have leave because of your behaviour. I remember when one of faculty teaching us Constitution you came and said her that not to teach like us and black bla. Despite the fact that she teach best and always with students. Tell me mam what Family law, Corporate law, Criminal law faculties leave the institute. Why the case against NIRMA? ( Walli Khan) Mam he cleared the JACK exam which is one of the toughest exam but because of your ego you did not publish in the website and also inform other students about the same as you inform the students about the RJS exam. Mam please spare your ego and try to be friendly with students. If you really have some real facts and if you feel that you have strong reasons to support your argument, please be strong enough and come forward with your face and present your case clearly before the authorities. Don't be coward, show some real sportsmanship.Let your arguments and issues come forward which you consider to be so very strong, if they are really true. Hoping for positive response. If you feel that there are lacuna or flaws in the report posted above, please feel free to reach out to us with your side of the story at fsa712@gmail.com. Don't stay Anon, let your voice be heard. Mail us. The average placement of 5 something lakhs is also false(which btw is also mentioned clearly in the libartatem article which was also one of the issues in this ILNU false reports Scam which you ignored completely), please look into that. And talk to the students and faculties and not just the ditector. Hey anonymous user who is calling other anonymous users a coward, we don't see your name either! And FYI students have come out to the administration but the group email IDs which could facilitate a discussion between students and the administration have been blocked. So much for sportsmanship, right? नेहा तुम इतनी बोल्ड कैसे? To be honest, the 5. something lac average package reported by NIRMA is not false. The average is around some 5.15 lacs. Unfortunately the Libartatem writer did not realize that the stats which were available to the public did not include the Fellowships which the students of NIRMA have received. The article at Libartatem also was wrong about the number of students placed till then. Unfortunately, as the statistics are college confidential property, we are not at the liberty to publish the same. But if you are a student of NIRMA, I am sure your department should be more than happy to provide you the details directly. Apart from that if there are any allegations against the college which you can prove. (The key word here being "prove") we would be more than happy to publish what you want said. Neha, The Individual IDs are still working. If you REALLY have any suggestions or wants to discuss any thing with the administration, you can still do that peacefully. But you didn't, we have clear proof of that, that you did not mailed in individual capacity to anyone in the administration. Wow, Sherlock. When the matter concerns the whole college, your solution is that each of the 700-800 students should mail the administration individually. A communication between two individuals is a dialogue but what the college needs now is a discussion. Unfortunately, a discussion is something which we as an institute have always shied away from. And what do you think would be more effective, a thread of email amongst the students and the institute voicing their concerns or a one-on-one dialogue which we have been attempting to do with the administration for years now. It will be great if you check with the so called "in house" magazine of ILNU, whether the stats they have so proudly shared are correct. If you cannot see how the press note has been changed into giving it a completely different meaning by dropping off important words like, "Off campus placements", which was the main issue to your batch, then there is some problem in your understanding. I am as much a student of ILNU, and however much I hate to admit this, you are wrong in your arguments. I'm a member of CRC, and I am more than sure, you will get the placement stats (the correct and updated version). And you think leaking internal emails to some gossip monger newspapers/websites will solve the issue? If you didnt have the audacity to come up and raise your concern then, you are no one to post it online and bring the institute a bad name. Aren't you one of the moot achievers? I dont think you will like it if someone told you that you didnt deserve it bcause youre from such a college. Or maybe you get a rejection on your next internship application only because of this online campaign against ILNU that youre part of? Neha, Don't bother about the college, there are other people who are initiating their problems and getting it resolved with the administration. If You have any issue , you come individually to the authorities. Also, the group IDs are working now, you may raise college concern on behalf of 700 students now freely. Go Ahead. Bhai tujhe angrezi kya nirma yaan director sikhaenge? I don't have any vendetta against the college. I would be associated with NIRMA for the rest of my life, and therefore I believe that with the kind of talent we have here, there's much more we can do. Turning a blind eye towards the many flaws or ignoring or denying them just because of the apprehension that I would face rejection in my internship or I wouldn't get placed is not a reason enough for me to keep quiet. When our moot achievements can be posted online then why can't the shortfalls as well? I appreciate your view. My point being, before you allege something against the college on an online platform, the least you can do is verify that once. Believing everything written in a newspaper article and believing it prima facie is not what a prudent law student like you is expected of. For example, all the interviews quoting Alind Chopra's placement have posted them without even speaking to him. He has not been in touch with any online platform or newspaper. The stats by libertatem are only half-true. Shortfalls are good to be posted only if you can back them up with proof. What I mean is, if you keep talking about the college here where no issue can be solved sans the administration, a. Your issue will remain an issue, and b. Youre bringing a bad name to the institute for something that is not proved. I dont know if youve gone through this article and checked the difference between what was sent to the newspaper and what was printed, you will understand. For once, stand up for your institute and stop pointing fingers at them for something they didnt do. I clearly understand the point you made and rest assured I stand in solidarity with the college. I assume that if you are a student/faculty of Nirma you would know that there are issues with college that are needed to be addressed. It's not just about placements. The placements story was the final strike which gave way to other problems that students face in the institute, and it all came crumbling down. I am a student of ILNU, every time I go to a moot, I feel proud to represent my college. But I can't just blindly justify every thing that's wrong. I have attempted to contact administration about the problems but nothing can be done till August. All I believe is that if we push for change internally and externally, it would have more impact. Also, anonymous user, I have many things to discuss with you, but are not appropriate to be posted here. Since I don't know your identity but you know mine, it would be a more fruitful discussion if we could chat freely about this very productive issue without it bringing "bad light" to our college. You can find me on Facebook. Hoping to hear from you. I will see you in person. In august. I have been in touch with Ahmedabad Mirror, Libertatem and others and I know for the fact that they have all your emails copies, chat records, call recordings of each and everyone who have unveiled their placement figure. They have all the proofs and given the right circumstance, they will release that too. The records of 16L package, the records of 12L fake package when the student sent email to confirm with CRC and received no response, the proof where college stated in mail that RBL bank is offering 1.8L CTC and just to coverup your fake average package of 5.25L you have fudged the data and inflated the CTC of RBL Bank to 2.1L which can be proved from college CRC's emails. Don't ever think media houses are publishing without investigation. It's just that hearing college's version is not required as everyone knows what the college will say. Don't worry, proofs are there but are not released and once it is released, college will not have answers for it. I have been in touch with Ahmedabad Mirror, Libertatem and others (who are not so immature as you are and they know very well when to release the proof with all records to expose your paid report) and I know for the fact that they have all your emails copies, chat records, call recordings of each and everyone who have unveiled their placement figure. They have all the proofs and given the right circumstance, they will release that too. The records of 16L package, the records of 12L fake package when the student sent email to confirm with CRC and received no response, the proof where college stated in mail that RBL bank is offering 1.8L CTC and just to coverup your fake average package of 5.25L you have fudged the data and inflated the CTC of RBL Bank to 2.1L which can be proved from college CRC's emails. Don't ever think media houses are publishing without investigation. It's just that hearing college's version is not required as everyone knows what the college will say. Don't worry, proofs are there but are not released and once it is released, college will not have answers for it. Primarily let me clarify that I have nothing but respect for the other websites, like Libertatem Magazine etc who had published the previous report. So if you are from one of those websites, we assure you that this is not an attempt to target you. But nothing you have stated above, nor anything released by Libertatem or Ahmadabad Mirror or any other place which challenges or counters the claim in this Article that Ahmadabad Mirror fudged the article and misreported. But unlike you we wont claim that we are sitting under a trove of secrets which we wont reveal cause the moment does not seem dramatic enough for you all. Or maybe cause you actually don't have the prove to challenge this version. Also trust us that if we were in the business of receiving money for articles, our website would look and function far better, like some other websites we can name. Last but not the least we would be MORE than happy to even publish your side of the story. We are actually in the process of editing and cross verifying a different version to this sent by a student of NIRMA. So if there is merit in the accusation, that would be published too. As for this, " Don't worry, proofs are there but are not released and once it is released, college will not have answers for it." Do you mean to say college will *have* to answer for it or *not* have to answer for it? Assuming that youre also part of the law fraternity, your idea of resolving issues is highly flawed. When you say "hearing the college's version is not required", ever heard of "hear both the sides"? Everywhere every accused will defend himself, so that means they should straight be hanged, because hey, we know what they are going to say! About emails and proofs, we all know how this student has been leaking out emails between the students and the administration to these newspapers and magazines, and one of the magazines is in fact a recepient of all student emails, the much celebrated Libertatem. The point being, the same email from the Director has been reproduced in this article, and that proves a point. Unless youre so touchy that this email hurt you or you felt threatened by such words. Proofs of alteration of words by Ahmedabad Mirror has been shown in this article, so I dont know what auspicious time youre waiting for to give the "proofs" you have. Its not even about the college anymore, its about basic logic. Despite seeing how Ahmedabad Mirror conveniently dropped an important word like "Off Campus", you still want to back them up with your theory of ILNU is such a bad place to be in, then good luck to you. Dont worry, proofs are there it seems. Please show us the proofs and prove us wrong. Ps : If a paid article was to br published, it wouldve gone to lawctopus because that is the genius website that "defamed" ILNU and would shamelessly accept any paid articles and contradict themselves. If this page is trying to bring out the college's version, it doesnt have to be paid. Not everyone is like the "insider trader" from Apna Nirma. b) take out grudges against others. Like my team has said before, if anyone has an alternate version with proof to the same we would be more than happy to feature all of you.